Unlike previous Alpine Trials, run almost exclusively in the old Kingdom of Savoie, this year’s event explores new territory in the Jura, west of the Rhone, before moving into the Alps for the finale. The Jura is ideally suited for vintage motoring, with empty, sweeping roads crossing a high plateau landscape of rich pasture and dark forests, occasionally incised by deep valleys surrounded by towering limestone cliffs. We start in the little-known town of Divonne-les-Bains, nestling next to the Swiss border near Geneva. Whilst not as big or glamourous as most French spa towns, the facilities of the wonderfully period Grand Hotel, and its adjoining casino, should make up for the shortage of local tourist attractions. The final two nights will be in the familiar lakeside setting of the Hotel l’Impérial Palace, Annecy. Because Divonne is so compact we do not need to take you on a long run through suburbia to reach the action - the Jura mountains rise like a green wall behind the town and you will literally be climbing them within minutes of leaving the hotel. As in previous years, the Alpine Trial is divided into three distinct “loops”, each one designed to give you the full flavour of this beautiful and interesting area of France. We have included enough time in the daily schedule to allow for a refreshment halt in the morning and afternoon, plus a longer stop for lunch. These are often in traditional wayside establishments, to add character to the event as well as giving much welcome trade to many of these remote rural communities. 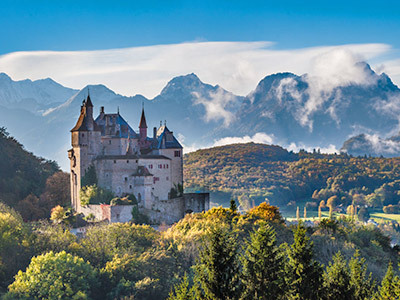 The Jura mountains lie in a series of forested ridges running NE to SW along the Franco-Swiss border reducing in height towards the west until they final peter out on the vast Plain de Bresse. Today you will cross, and then re-cross, their entire breadth. Once over the top you enter a landscape of high mountain pasture and forests, criss-crossed by a network of empty roads just perfect for the first regularity of the day. From there, a carefully chosen route to avoid the busy town of St Claude takes you through pretty villages and towering limestone cliffs to the first test of the day and a chance to enjoy a welcoming cup of morning coffee. The Jura mountains are cut by a number of rivers running in deep valleys and we cross one of these, the Ain, to get to the next sections. West of the Ain, the landscape is more gentle and benign but careful navigating will be needed before you finally descend onto the vast Plain de Bresse. Lunch will be taken at a private motor sport facility, where we have also arranged two tests, before turning east again to climb back into the Jura. Again, attention to the maps will be needed as the route re-crosses a predominately rural landscape before an afternoon refreshment halt overlooking the Lac de Vouglans. 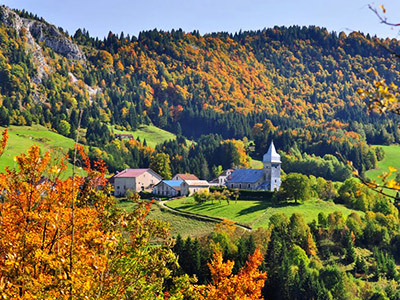 Re-entering the Haute-Jura, a further regularity awaits in its forests before the road descends into the depths of the Gorges de la Bienne and an attractive drive into the town of Morez. A final climb past the old fortified resort of Les Rousses follows before a run down the mountains brings you back to the Grand Hotel and a welcoming drink. Today the route heads south-west to follow the line of the Jura mountains and cross the valley of the Rhone. Between the valley of the Valserine and the Rhone lies a final ridge of mountains, well known to rally enthusiasts, which we explore extensively this morning before re-crossing the Rhone and heading into the Bugey. This small attractive area of rolling hills bordering Lac de Bourget is a delight, with a maze of lanes connecting pretty stone villages nestling amongst the vineyards of Savoie. After a welcome refreshment break we continue south into slightly higher terrain before having lunch at a waterside restaurant on the shores of the Lac d’Aiguebelette. The action re-starts immediately after lunch with a regularity in a little used area of Savoie before turning east towards the sheer rock walls of the Chartreuse Massif and a relaxing run through ever higher mountains to the afternoon café Time Control at the very top of the famous Col du Granier, overlooking Chambery. A gentle run down through the vineyards of the Isère valley precedes a final regularity before the route swings north into the Bauges National Park. No Alpine would be complete without a climb of the 1600m high Montagne de Semnoz to admire the superb mountain vistas on offer. All that then remains is an easy descent into Annecy and the Hotel l’Impérial Palace, situated right on the edge of the picture perfect Lac d’Annecy. The day kicks off with an easy run out of Annecy before the first regularity explores the roads of the Chaîne des Aravis, finishing with a climb of the eponymous col from which you will get your first glimpse of Mont Blanc straight ahead. After descending into the valley of the Arly the route then climbs again to the Olympic ski resort of Les Saisies for a test and morning coffee break before embarking on a timed Alpine section around the Beaufort valley. As befits its name, this section finishes at the highest point of the rally before returning to the valley and an easy run towards Albertville. However, valley runs don’t last long in the Alps, and a second regularity precedes another climb to a simple lunch at a remote mountain refuge surrounded by craggy peaks and spectacular views. After lunch we have given you and your car plenty of time to enjoy the dizzying descent from the high alpine pastures before a final regularity through the lanes brings you back almost to within sight of Annecy. A final afternoon refreshment halt overlooking the deep blue waters of the lake gives you time to relax before the easy run into the finish, and a gala prize giving later that evening in the Hotel l’Impérial Palace.